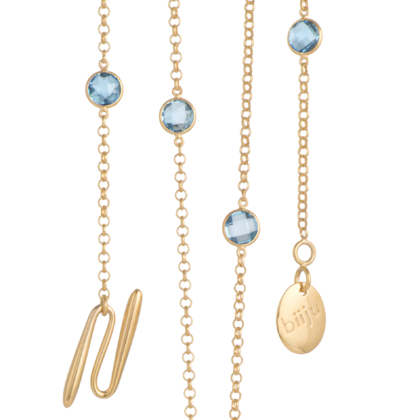 Beautiful, colourful & stylish, the Spotlights chain can be worn in different ways - swipe to see images. The chain length is adjustable allowing you to tailor it to your outfit.Full length: 27.5" (68.5cm) adjustable to 24.5" (62cm). 4 Swiss blue topaz stones, 6mm each, 3 carats in total. Handmade in London's Hatton Garden with a great deal of love & expertise, & hallmarked by the Goldsmith's Assay Office.